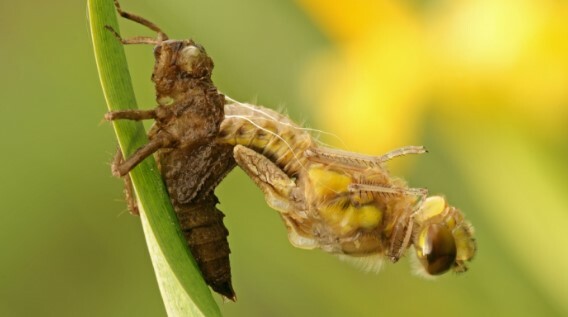 Eclosion of a dragonfly. Image by panthemedia. Die Abstammung des Menschen als naturphilosophisches Problem. Witzany, G (ed) Würzburg. Königshausen & Neumann. Natur der Sprache - Sprache der Natur. Sprachpragmatische Philosophie der Biologie. Zeichenprozesse als Bedingungen der Möglichkeit von Leben und Evolution: Zur Notwendigkeit einer Molekularpragmatik. From the „logic of the molecular syntax“ to molecular pragmatism. Explanatory deficits in Manfred Eigen’s concept of language and communication. Evolution and Cognition 1: 148-168. In: I.Rauch, G.F. Carr (eds). Semiotics around the World. Synthesis in Diversity. Mouton de Gruyter, Berlin/New Yorkpp. 977-980. Explaining and understanding LIFE. The biosemiotic model and some suggestions in the light of pragmatics of language. Norderstedt. Libri Books on Demand. Reduction of biological phenomena? Defictis of systems theory and the alternatives. In: W. Schmitz (Ed.) Sign Processes in Complex Systems. Mouton de Gruyter, Berlin/New York, pp 303-307. Sprache und Kommunikation als zentrale Struktur- und Organisationsprinzipien belebter Natur. In: L.Albers, O. Leiss (eds). Körper-Sprache-Weltbild. Integration biologischer und kultureller Interpretationen in der Medizin. Stuttgart/New York, Schattauer, pp 87-96. Metaphysics in Physics and Biology. Feinkostladen und Welthunger - natura naturans versus natura naturata. From biosphere to semiosphere to social lifeworlds. Biology as an understanding social science. Natural history of life: history of communication logics and dynamics. Mitteilungen Österreichisches Getränke Institut, 4, 68-72. The Logos of the Bios 1. Contributions to the foundation of a three-leveled biosemiotics. Serial Endosymbiotic Theory (SET): The biosemiotic update. Natural Genome Editing Competences of Viruses. Plant Communication from Biosemiotic Perspective. Plant Signaling & Behavior 1(4): 169-178. Živá Príroda Jako Globální Komunikacní Spolecenstvi. In: Kleisner K, Kliková A (Ed): Umwelt - koncepce živého sveta Jakova von Uexkülla; Amfibios; ISBN: 80-86818-24-1. In: Witzany, G. (Ed.) Biosemiotics in Transdisciplinary Contexts. Helsinki. Umweb, pp 295-301. The Agents of Genomic Creativity. In: Witzany, G. (Ed.) Biosemiotics in Transdisciplinary Contexts, pp 295-301. The Logos of the Bios 2. Bio-Communication. Biosemiotics in Transdiciplinary Contexts. Proceedings of the Gathering in Biosemiotics 6, Salzburg 2006. Sign Systems Studies 35.1/2: 295-299. Bio-Communication of Unicellular and Multicellular Organisms. Bio-Communication of Bacteria and their Evolutionary Roots in Natural Genome Editing Competences of Viruses. Open Evolution Journal 2: 44-54. The viral origins of telomeres, telomerases and their important role in eukaryogenesis and genome maintenance. International Journal of Integrative Biology 5(3): 152-163. In: A. Chauhan, A. Varma (eds). A Textbook of Molecular Biotechnology. I.K. International Publishing, New Dehli. In: Witzany G (ed). Natural Genetic Engineering and Natural Genome Editing. Annals of the New York Academy of Sciences, Vol. 1178: 1-5. In: Witzany G (ed). Natural Genetic Engineering and Natural Genome Editing. Annals of the New York Academy of Sciences, Vol. 1178: 244-267. Journal of Theoretical Biology 262(4): 698-710. In: Biocommunication and Natural Genome Editing, Springer 2010, pp. 1-26. Communicative & Integrative Biology 4:5, 1-5. Do we eat gene regulators? Communicative & Integrative Biology 5(3). Essential Agents of Life. Springer, pp 407-419. Life's Code Script doesn't code itself. At the dawn of a new revolution in life sciences. In: Witzany G (ed). Biocommunication of Animals. Springer, pp 1-6. In: Witzany G (ed). Biocommunication of Animals. Springer, pp 135-147. How Corals Coordinate and Organize: An ecosystemic Analysis Baseed on Biocommunication and Fractal Properties. In: Witzany G (ed). Biocommunication of Animals. Springer, pp 351-382. Life is more than a computer running DNA software. World Journal of Biological Chemistry 5: 275-278. Pragmatic turn in biology: From biological molecules to genetic content operators. Language and Communication as Universal Requirements for Life. In: Kolb V (ed). Astrobiology: An Evolutionary Approach. CRC Press, pp. 349-370.
in: R.Gordon, J. Seckbach (eds). Biocommunication: Sign-mediated interactions between cells and organisms. pp. 37-61. Entrevista a Guenther Witzany: El código genético es un lenguaje real, no solamente und metáfora.